Dessertbuzz | Recommended New York City hot chocolate: as a meal or easy-to-drink? 1) The hot-chocolate-as-dessert camp. These people believe that no hot chocolate is too thick or too sludge-like. They’re happy if a plastic spoon can be stood on end, supported only by the pudding-like contents. They view hot chooclate as a meal. 2) The hot-chocolate-is-a-drink-like-coffee camp. These people are no less fussy about quality, percent cacao, etc. but they believe that you should be able to drink hot chocolate easily in any situation where you would drink coffee or tea. If they get a cup of hot chocolate and notice that it spills easily they are happy. 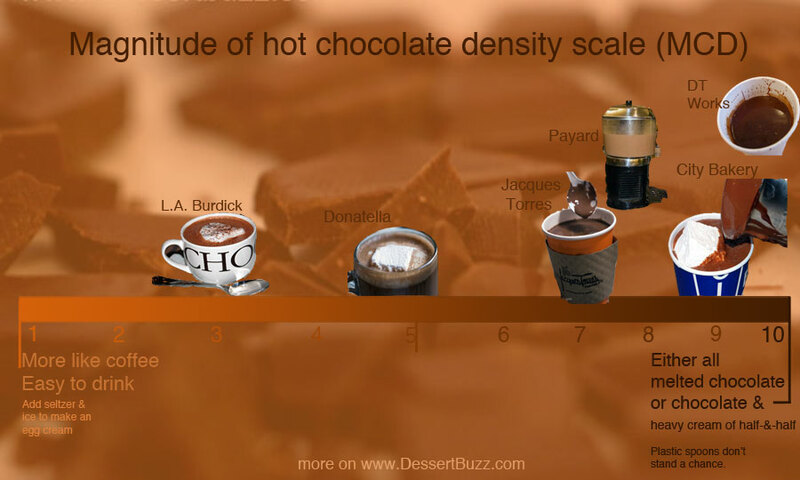 To make things easy, Dessert Buzz is rolling out a 10-point scale to rate the density or thickness of the different hot chocolates. A ranking of “one” means the hot chocolate is drinkable and fluid. A rating of “ten” means it’s basically melted chocolate or melted chocolate with some heavy cream or half-and-half–you get the idea. City Bakery Notes: Very, very thick. A solid 9 on the MCD scale. Interesting and innovative flavors. Annual hosts of the Hot Chocolate Festival. 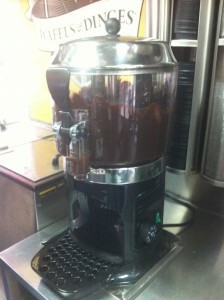 Every day in February 2012 they will feature a different hot chocolate flavor such as fresh ginger, banana peel and “What would Faulkner drink”. City Bakery’s website is here. Main location is 3 West 18th Street. Dessert Truck Works Notes: Valrhona chocolate. Very thick, not quite as thick as City Bakery but at least an 7-8 on the MCD scale. A long-time DessertBuzz favorite. Dessert Truck Works is located at 6 Clinton Street. Their website is here. Donatella Notes: Really more of a restaurant but I’m including them because they have such a great pastry chef in Andrea Jarosh and also superb pizza. Not a thick hot chocolate–easy to drink (a 5 on the scale). Also made with Valrhona chocolate. Because they are a restaurant they can add a shot of alcohol. Donatella is located at 184 8th Aveneue. Donatella’s website is here. Francois Chocolate Bar is located in the Plaza hotel food hall at 1 West 59th Street (Francois Payard Bakery at 116 West Houston St. also has this hot chocolate). The Francois Payard website is here. Jacques Torres Notes: Plenty of locations around the city, a number of different size and flavor options and a great value at $3.59 for the small or $4.36 for the large. An 8-9 on the MCD scale. Available in classic, wicked w/chilies, peanut butter and mocha. Jacques Torres has five locations in the city. The Jacques Torres website is here. 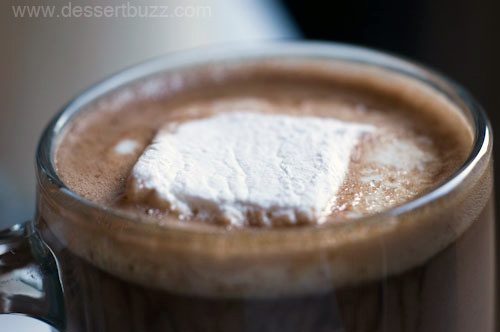 L.A. Burdick Notes: Our favorite easy-to-drink dark hot chocolate, a very pleasant shop in Flatiron where you can sit down and enjoy your drink. A 3 on the MCD scale. L.A. Burdick is located on 5 East 20th Street. L.A. Burdick’s website is here. Peels Notes: very thick, comes with a delicious honey-vanilla marshmallow. They are in the 9 range on the MCD scale. Try a slice of their “monkey bread” too. Peels is located on 325 Bowery. Their website is here and their bakery “special order” form is here. La Maison du Chocolat Notes: Available in two grades–milk and dark chocolate (we agree with Kathy YL Chan of Serious Eats NY –go with the dark), nice shop to drink in (Rock Center). A 6-7 on the MCD scale. La Maison du Chocolat is located at 30 Rockefeller Center (49th Street). Their website is here. Wafels and Dinges Notes: (See their website and Twitter feed for locations) Very thick Belgian chocolate, half-and-half base, uses similar machine to the Ugolini at Francois Chocolate Bar. An 8-9 on the MCD scale. Add a Liege waffle while you are at it. Tip: Check the Wafels and Dinges Twitter feed daily to learn the question for a free topping. Wafels and Dinges’ website and schedule is here. 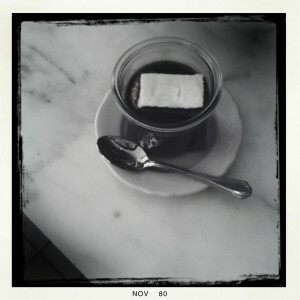 Other recommended NYC hot chocolate: Grom, Via Quadronno and Tarallucci E Vino. Follow DessertBuzz on Twitter. I’m not a big fan of hot chocolate because the only ones I’ve tasted are those watered-down ones! I would definitely go for the super-thick hot chocolate- a little goes a long way. I just went to Donatella on Monday night, and they did not have any hot chocolate at all. I was very disappointed. 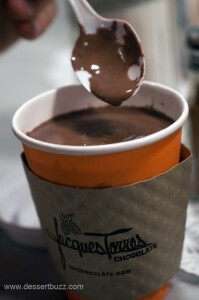 So I went to Amy’s in Chelsea Market instead, and surprisingly they had quite good hot chocolate — I never knew. This list is otherwise excellent, though I might add D’espresso on the LES. If your wine lover isn’t lucky enough to have an entire room devoted to their wine storage, then it’s time to consider going for broke and getting them a wine cellar. Haha, there seems to be a misunderstanding. 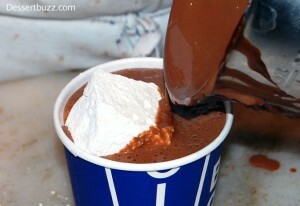 I meant that the only hot chocolate I’ve tried are the not-so-good ones (drink mixes like the ones from Godiva). I always felt that they lacked the thick melted-chocolate drink that I was looking for. I’d be curious where you’d rank Via Quadrono on this list. I’ve always considered L.A. Burrdick to be super thick, and Via Quadrono comparable – I can’t imagine that Burrdick is only a 3 on your list!